“The greenest building is one that is already built”. Adaptive reuse refers to the modification of a heritage place to a new use that conserves its heritage values. This may involve the introduction of a new service, a new use, or changes to protect a heritage item. Preservation is typically a time consuming and expensive process it is generally reserved for the most historically significant buildings. Adaptive reuse is a more affordable alternative to restoration which preserves some of the building’s historical elements while converting many of its functions to accommodate modern users. 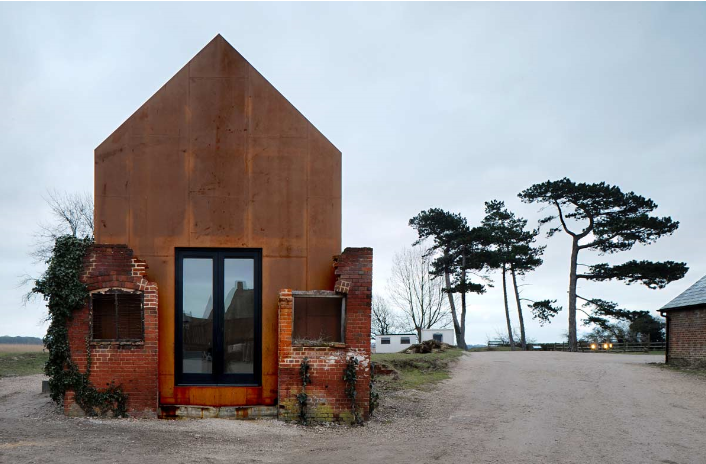 Dovecote Studio, a music studio built within the remains of an old red brick Victorian pigeon house. The benefits of adaptive reuse are a combination of economic, social and environmental factors. Many heritage buildings were built for a use that no longer exists today. Viable new uses need to be found for these building in order to conserve them. Sometimes adaptive reuse is the only way that the building’s fabric will be properly cared for, revealed or interpreted while making better use of the building itself. Redundant buildings are vulnerable to neglect, decay and even demolition. Adaptation also makes good economic and environmental sense. Adaptation provides a new economic use for the building. Adaptive re-use makes sound economic sense if the adaptation creates enough financial value to cover the cost of both conservation and adaptation, as well as the long-term maintenance of the building. Adaptive reuse is said to have a major role in the sustainable development of Australian communities. The quality and design of the built environment in our towns and cities is important to our standard of living. We increasingly preserve old buildings and neighbourhoods out of a desire to retain their historical, social and aesthetic cultural significance. Adaptation can provide direct value to places through improved property prices and indirect value through the transfer of value of the project to adjoining properties. Conservation projects typically employ more workers than more modern building projects and they help to retain much needed trade skills that are at risk of being lost. One of the main environmental benefits of reusing buildings is the retention of the original building’s ‘embodied energy’. According to the CSIRO embodied energy is the energy consumed by all of the processes associated with the production of a building. From the natural resources to the product delivery, including mining, manufacturing, transport and administration functions. According to the Department of the Environment and Heritage in 2001, new building accounted for about 40 % of annual energy and raw materials consumption, 25% of wood harvest, 16% of fresh water supplies, 44% of land-fill, 45% of carbon dioxide and up to half the greenhouse emissions from industrialised countries. The Heritage Council of NSW states that construction waste accounts for 33% of all land-fill in Australia. Over 75% of this is clean fill, brick, timber and concrete. Recycling old buildings and materials significantly reduces waste. Many 19th early 20th Century buildings were constructed using materials and techniques that can be more expensive but last longer. In many cases they will need to be repaired or replaced at half the rate of more modern buildings. Lastly, these types of projects are important as they promote innovation. Designers are encouraged to produce creative designs that support a new use for the old building while protecting its heritage significance. What is a successful adaptation? A good adaptation is one that is sympathetic to the existing building and its historic context, and inserts new work or makes changes that enhance and complement the heritage value of the heritage item. The new use must be compatible with the building, retain its historic character and conserve significant fabric but it can still introduce new services as well as modifications and additions. Any new work should be undertaken with an understanding of the building’s heritage significance. It is important for designers to create a relationship between the old and new whether they elect to take a traditional, vernacular approach or a more contemporary one. The Heritage Council in conjunction with The Royal Institute of Architects (RAIA) (now the Australian Institute of Architects (AIA)) has put together a checklist for achieving a successful adaptation. Reveal and interpret the heritage significance of the place as an integral and meaningful part of the adaptation project. Generally speaking, as most of the heritage buildings were built long time ago, their design and facilities provided usually do not comply with current building codes and regulations that deal with fire protection, disability access, health and safety, security requirements and energy efficiency. A certain degree of alterations and additions is usually required if new facilities are to be installed or if the buildings are to be adapted for re-use. In certain heritage buildings, incorporation of facilities that are necessary to fulfill modern needs may have adverse effects on their architectural value. Careful treatment and sensible design in preserving the heritage value of the building may reconcile the two distinctive needs. Take a look at some impressive example of local adaptations of old buildings in our New Designs for Old Dwelling section. Click here. For further information refer to New Uses for heritage places: guidelines for the adaptation of historic buildings and sites produced by the Heritage Office and the Royal Australian Institute of Architects (now the Australian Institute of Architects), 2008. In instances when adaptation involves new infill buildings refer to Design in context: guidelines for infill development in the historic environment also produced by the Heritage Office and the Royal Institute of Architects (now the Australian Institute of Architects), 2005.